Not only did I complete the blocks, I got them all sashed with cornerstones, ready for borders. Didn’t touch this one. I had too much fun making Scrappy Trip Around the World blocks instead. Not only did I get this one sandwiched, but it is now quilted (as of yesterday) and the binding is half sewn down. I had it in my head that my goal was to finish this quilt. Silly me. Sandwiched Easy Street, Asian Splendor, and Roll Roll Cotton Boll. 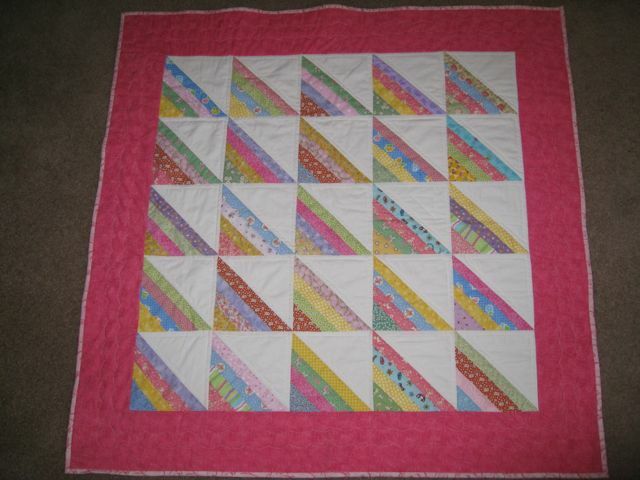 I found a layout I like for the Pink Roll Roll Cotton Boll blocks I have finished. Made a Topponcino for my niece who is expecting a girl in August. Started a black and white quilt for my grandson. Did quite a bit of hand quilting on the Christmas quilt that has been hanging around for way to long. I’ll post pics of these accomplishments in another post. Hooking this up to Judy’s Getting it Done in March post. It’s the end of February already. And, time to report on our UFO completions. This month, Heather at Peachy Pages chose number 10. That’s this preemie quilt for me. I actually finished it in January. And, Marti from 52 Quilts in 52 Weeks chose number 4, Orca Bay for me. While I didn’t finish Orca Bay, I did finish the top and that was huge for me this month. Check out both blogs to see what everyone else completed this month. I do have something new to post today. I finished this top on Saturday. This is the baby quilt for my friends second granddaughter. A Double Hour Glass. It’s also on my UFO Challenge list for this year. Check out what everyone else has on their wall here. 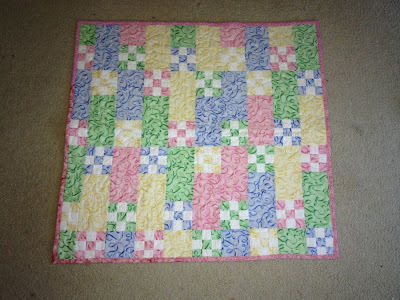 This is my first attempt at the Square Dance or Twister pattern. I made my own template so I could use some pre-cut 6″ charms from a swap a few years ago and not have any waste between the secondary cuts. 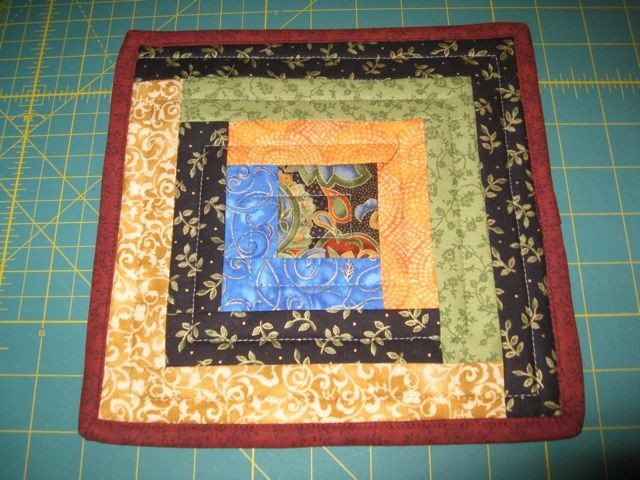 As you can see, I used the left over squares in the border. This one is goes to new baby boy, Roy Peter, born on Thanksgiving. He weighed in at 10 pounds 3 ounces. Wow! I really like making this pattern and it is such a great use for those odd 6″ squares that I can’t figure anything else to do with. Here’s what’s on my design wall right now. Blocks I’ve been putting together for a Double Hour Glass baby quilt. These were made from my 1.5″ scrap bin and some white muslin 1.5″ strips. I have three baby quilts to make this summer and these are for one of them. I got the idea from a tutorial on the Cluck Cluck Sew blog. My blocks are much smaller finishing at just under 4″ square. I’m not sure how big this will be or what kind of borders I’ll use yet. It’s just developing as I go along. For more Design Wall Monday links, visit Judy’s blog. What’s on my wall today? These are blocks I’ve been making over the last four weeks or so, all from scraps. 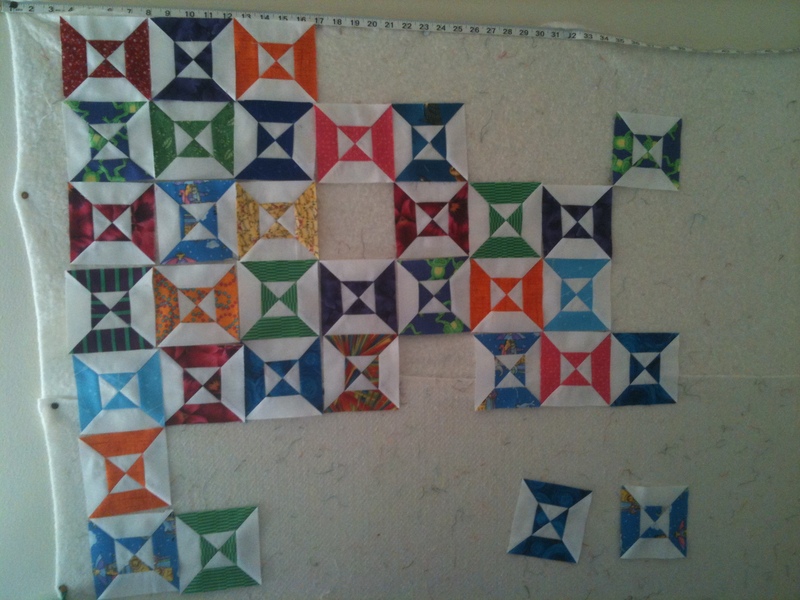 They are laid out in Bonnie Hunter’s Patches and Pinwheels pattern. So far I’m really liking it. Very scrappy. 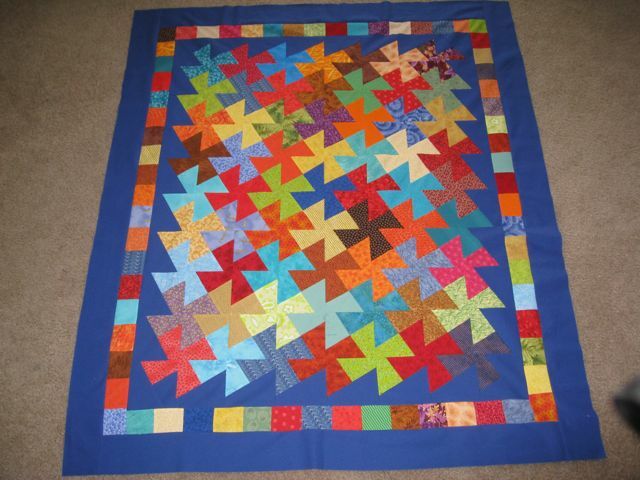 I need to make lot’s more 16 patches and a few more pinwheels. They won’t all fit on my wall, but this gives a good idea of what they will look like when sewn together. I had a three day weekend this past weekend, and here’s what I accomplished. A Trust Me or Square Dance top. Started on Friday morning, cut apart and sewn back together on Saturday, and borders added on Sunday. I didn’t have a pattern. I searched on Google and found a couple of web shot albums that showed in progress pictures. So I calculated how big the template needed to be to work with my 5.5″ finished squares and away I went. 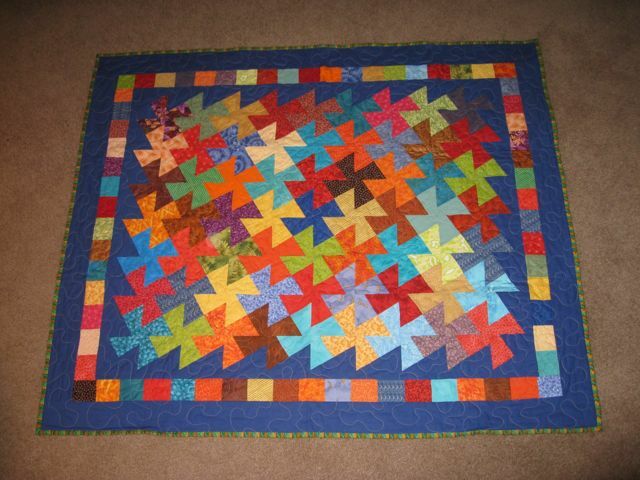 The inner border is made up of all the squares left over from cutting the pinwheels. It really was a “Trust Me” project. I was very doubtful that it would come out right. I took pictures along the way so I can write a tutorial for when I want to make this one again. This will be perfect for one of the baby quilts I need to make between now and November. The top finishes at 45″ x 53″. Want to know what everyone else is up to? Visit Judy’s blog today. It’s time I caught up with my blogging. Now that 2009 is rapidly coming to a close, I need to take stock of what I accomplished this year! The most important completions for me recently are the two Quilts for Kids quilts that I finished and sent off before Christmas. The blue one was made from the quilt kit that Quilts for Kids sent to me. The Roman Stripes pink quilt is one I whipped up from scraps and sent along with the blue one. 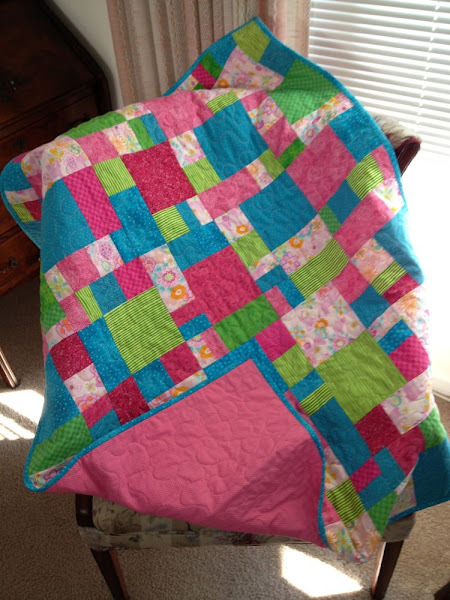 These were so much fun to make and a great way to improve my machine quilting skills. I have so much fabric that I want to make a few more of these from my own stash to send in early 2009. 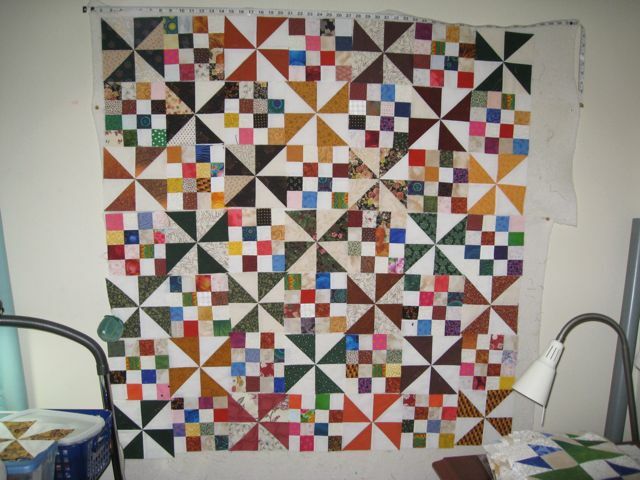 I think I’ll set myself a goal to complete two Quilts for Kids quilts per quarter in 2010. 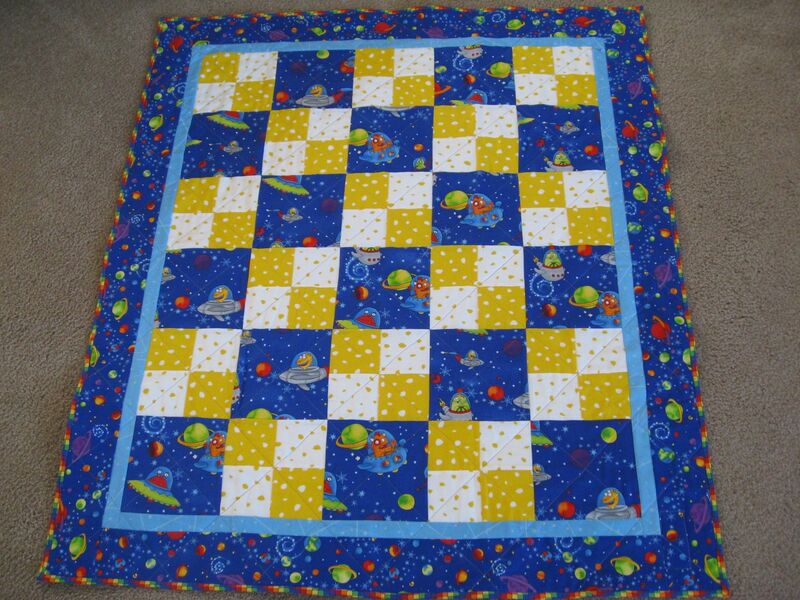 In addition, this year I completed two baby quilts for my two co-workers. You can read more about those quilts here and here. 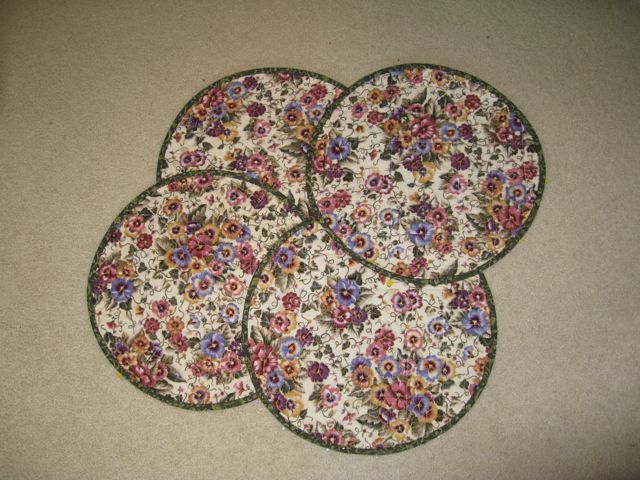 I also made a set of 4 quilted place mats for my good friend, Kathleen. She chose the fabric from my florals and I backed and bound them in a green blender so they are reversible. And, I completed 30 quilted pot holders for my Zonta Holiday Party gift bags. Oh, and I almost forgot the wall hanging that I made for my mother’s birthday in January. You can read about it here. I know it’s been a long time since I’ve posted here. But it’s not because I haven’t been busy. I have a three finishes to add to the list. All in all it’s been a pretty productive Fall. And, I’ve got a couple more quilts that just need some final quilting and binding. I hope to get those done in the next couple of weeks. I’ve also got my Christmas Lights quilt on my design wall ready to have the corner triangles added to the rows so I can sew the rows together. I’d like to get the rows together before I start Bonnie’s new challenge, which will begin the day after Thanksgiving. You can tell my grandkids are still in Louisiana with their other grandparents. My weekends are full of quilting at least for another couple of weeks. Here’s what I got accomplished yesterday. I got out all my 1930’s prints (of which there were more than I realized) and some scrap muslin and put this little baby quilt together using Mary’s Roman Stripes pattern. I ran out of the white so I couldn’t put the narrow white border before the pink. I think it is so cute. It’s all sandwiched and ready to be quilted. I’ll do something simple like a serpentine grid. 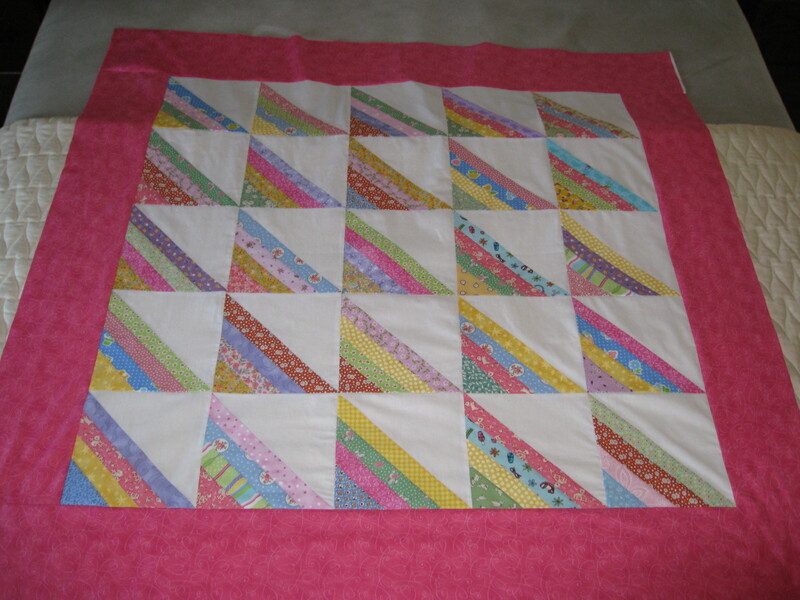 I also got the back ready for the wild baby quilt I’ve been piecing. It will get sandwiched today and hopefully I get some of the quilting done. I’ve also added my name to the list for the Shipshewana 2010 Retreat that Ruthie is organizing. I’m so excited. I think I’ve even found a roommate already. I just wish it was this year instead of 2010. I love Amish country. I spent a couple of days in Lancaster County last year after a conference in Philadelphia and I came home with 65 yards of fabric. I actually had to ship some of it home. 🙂 You can see some of what I got here. It’s a beautiful day here in the Bay Area today and I’ve just returned from an expensive trip to Target. Among other things, they had rolling storage bins on sale. The one with three big drawers for $8.99. I couldn’t resist. I won’t mention the brand but it starts with an S. I work for the company that makes Rubbermaid so I shouldn’t be buying the competition. But they are so cheap. What’s a girl to do!